HID Global entered the market of NFC inlays and labels with high quality products. Moreover, the firm launched Trusted Tag® Services, a combination of special NFC chips and an on-line authentication platform for convenient, secure verification of any individual reading/tapping action to implement a proof of presence. HID Global’s NFC inlays and labels are currently available with two different antenna models, both round and small. One has a 20 mm diameter, the other 35 mm. The two antenna models are offered in wet inlay and white paper label versions — with diameter of 29 and 40 mm, respectively — but also dry inlays can be supplied upon request. As standard, HID Global’s NFC inlays and labels leverage the NXP NTAG213 chip that provides full NFC Forum Type 2 Tag compliance, 144 bytes of user programmable memory, 32-bit password protection to prevent unauthorized memory read/write operations and scan operations counter. The products represent a quick and cost-effective solution to connect traditional physical items such as posters, magazines, product packaging, in-store displays, with the digital world of internet where companies can interact with their customers in real-time via NFC-enabled smartphones and other NFC devices. In case high-security is required, these NFC inlays and labels can be supplied with HID Global’s Trusted Tag® Services, a combination of special NFC Forum Tag type 4 compliant chips with 8 kB of memory and a cloud-based authentication platform that together allow effortless and secure verification of any single reading action, without the need for dedicated apps or hardware modifications to the involved NFC devices. With this solution, marketing managers can easily collect information on customers’ engagement while rolling out compelling marketing campaigns and promotions. HID Global’s NFC inlays and labels can also be delivered pre-programmed and pre-printed upon request. Please contact HID Global for additional details on these NFC inlays and labels, and also their high security reading verification platform. 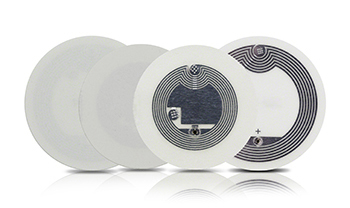 Do you need other types of RFID tags? Try our RFID Tag Search Engine or contact us at info@veryfields.net, also for suggestions about complete RFID solutions.